QATW Quilting Forum » GENERAL - Quilting Messages » GROUPS - Quilt Along » One Block Wonder quilts made here. One Block Wonder quilts made here. I recently saw a One Block Wonder quilt made from a beach scene panel. It looked like it used 5 panels with the 5th one used as the center and the OBW pieces grouped around it. Of course, I saved the photo. Of course. But cannot find it. Anyone know what I'm referring to? I've just found a panel that I think would be awesome for this. But the book recommends a 24" repeat and a panel doesn't repeat. Does it matter? As long as I use 4 identical panels? Any suggestions would be so welcome. ALBUM for us to use for sharing Blocks or Fabrics. Finished quilts will most likely be in your album. I think you would need 7 panels. One for the center and then 6 to stack and whack because each hexagon needs 6 identical triangles. I'll have to look into this! If the OBW uses octagons, doesn't that mean you need 8 panels plus the extra for the middle? I've only done four patch posies. That's my big challenge with squares. Yes, those are similar. It was on Facebook and I thought I'd saved it. So, Jacy, why 6 panels? Doesn't the book call for 4 identical lengths of fabrics? I have another OBW book around here someplace. This might be beyond my capabilities with directions for specifically what i want to do. But I want to do it. I found an awesome panel on fabrics.com. The one Jacky shows is hexagonal blocks so you'd need 6+1 panels. The one I showed uses octagonal blocks so it takes more. Depends if you want to use the equilateral triangle template or the 45-67.5-67.5 triangle template. It's been so long since I've made one. Well kind of made one. I got everything cut out and ready to sew together and decided I didn't like the colors. Jacy now has it. I thought i only had to cut out a stack of four fabrics but perhaps it was six. Her blog shows how she designed this one. Some blocks had triangles that were different colors. Never thought about that. That is an impressive quilt, Evelyn. I can see that took her some time and thought. The one I got from you had 6 identical triangles for each hexagon. I don't think you could do that without having 6 panels, plus one more for the center of your quilt, because there are no repeats on a panel. Thanks Jacy. I'm debating getting the panels. I'd need 7 and just spend a small bundle in fabric for a Christmas quilt. But, I may not be able to resist. Wow! I really like those one block wonders with the panels in them. So beautiful! I just received the 7 panels. 6 for the Wonder hexagon blocks and 1 for the center. This will be a challenge for sure. I would love to do one of these for Christmas. They are beautiful. I've done a few hexagon ones. Never seen them with the panel. I love that! I just found a beautiful angel panel. Hmmmm. Now you got me thinking! Judy, I can't post picture to the forum either with I pad. Looking forward to seeing your panel. I couldn't sleep last night, so I was on the hunt for interesting panels. I bought 9 of the Angel one I found. Fabric.com had a sale on it. 4.19 a panel. I will be excited to try this. 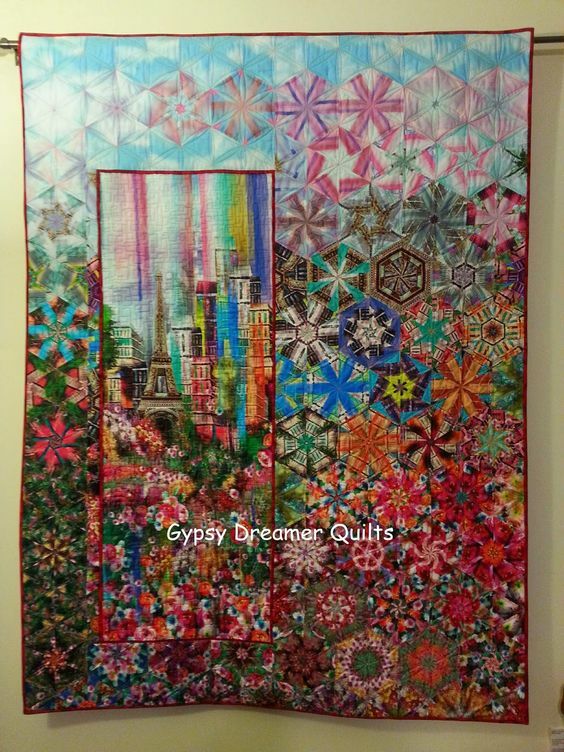 I have 2 or 3 books of kaleidoscope quilts. I think I even have a EQ disk. Need to hunt in my cabinet today.